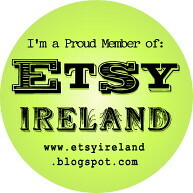 I am a mixed media and textile artist, working from my studio in Ballinacurra, Co. Cork, Ireland. Today I made these pretty thimble pincushion pendants. So many china thimbles in the world, all completely useless as thimbles...I wracked my brain thinking of something to make out of them. The best part of these is that it is so useful to have a pincushion on a chain! My husband is always finding needles on the floor and announcing 'THERE WAS A NEEDLE ON THE FLOOR' because he is in charge of health and safety when it comes to needles on the floor, only. Nobody has ever stepped on one, but 'SOMEONE COULD STEP ON ONE', so these pendants not only are sweet and pretty, but also will keep your home safe from minor albeit painful foot injuries. The best part is the tiny little tomato cushions. Aren't they adorable? With the little buttons. My fascination with pincushions is bordering on obsession. And the bizarre thing is that I haven't got a decent pincushion in the house, I use a pin dish. That is why we have so many needles on the floor. I was looking to make up something cheap and cheerful to put in my Etsy shop. I have a few very intricate items that were time consuming to make in my shop, that really seem unlikely to sell in this economy...I do enjoy getting the views and the 'hearts' on those items, though, so I pay the 20 cents to keep them listed, a small price to pay for the validation! 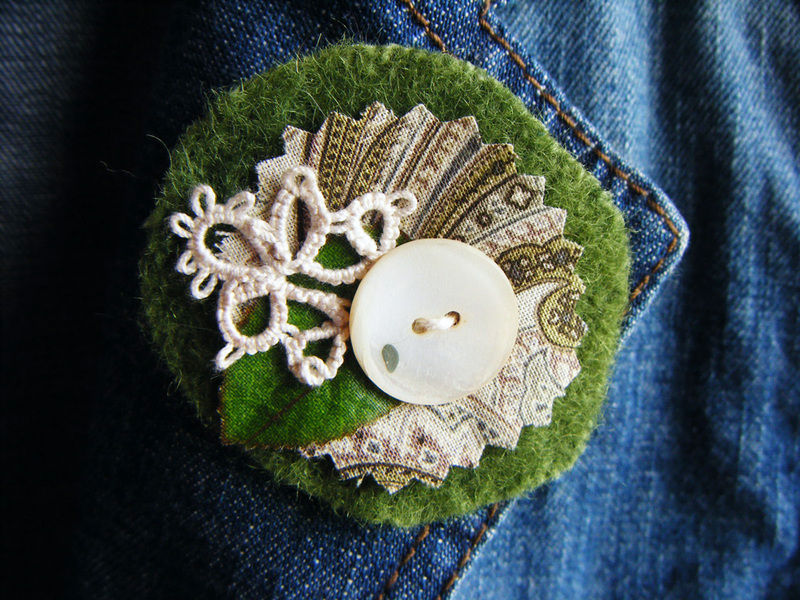 But I know from shopping on Etsy myself, that it's nice to be able to buy something small just as a treat, so I came up with these little brooches. 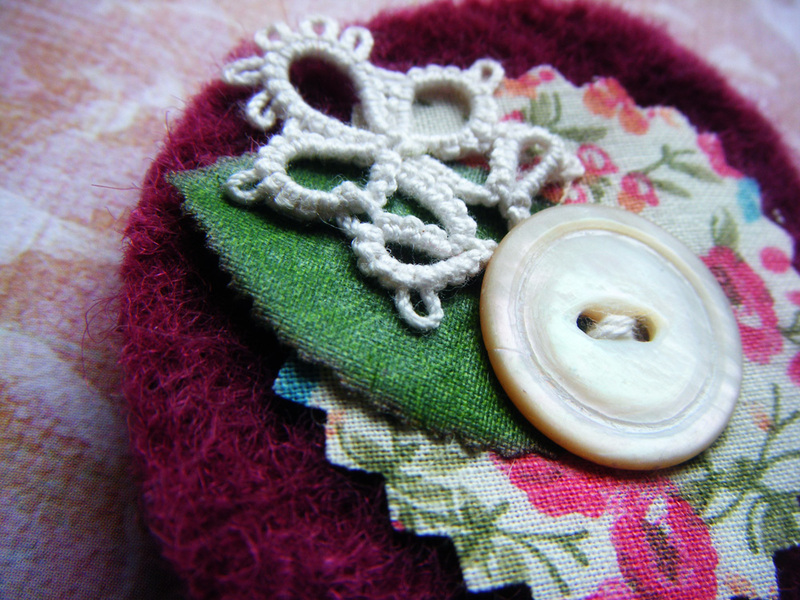 They have all of my favourite materials packed into them, thick wool felt and vintage lace and buttons. Fun to make, I hope someone likes them! Or even five people. Or one person who likes them a whole lot and has four friends with birthdays soon. 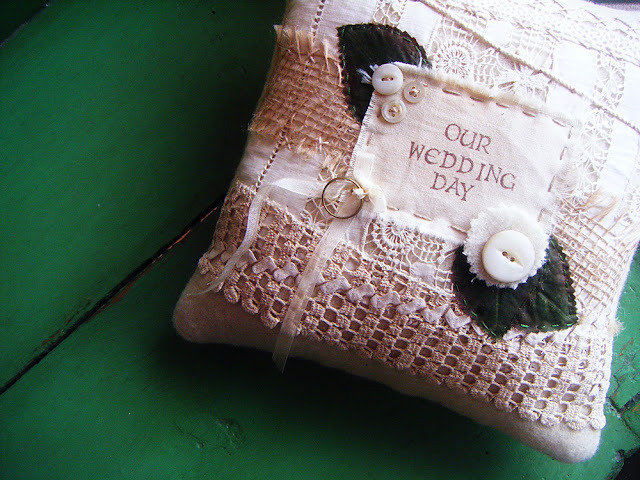 I had an enjoyable, productive day in the studio...completed another wedding ring pillow! I enjoy making these and wanted to make one in order to create a listing for custom orders on Etsy. The pillows are really easily customisable and can be personalised with the bride and groom's names and the wedding date, as well as incorporating any mementos or bits of textiles that are meaningful to the recipient. I would love to have some examples of personalised pillows to use in my listings...if any of my readers are interested, I am offering 25% off the price in order to assemble some sample photos, just comment here or email me! I completed a few other goodies today, just need to finish up some photos to list them during the week, yay!